Welcome to Corvallis and welcome to the Northwest Hills Family. The beauty of our church is that we have people in all different stages of life and we want to do everything that we can to truly connect people to one another and make this a place where you feel welcomed and at home. 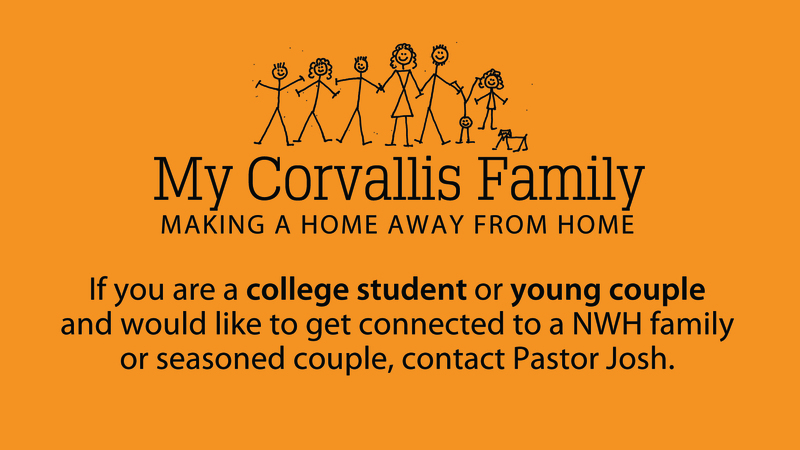 We know that there are many people who move to Corvallis and are away from their extended families. Some people move here for University, some move here for jobs and others just simply don’t have family in town. At Northwest Hills we hope to be a home away from home! We try to do this by paring younger students and families with older couples and families in our church. How does this work? Initially the hope is that the two parties will get together at a minimum of once a month for a term to start to build a relationship. Perhaps the families will get together for a meal, perhaps to watch a ballgame or perhaps to go on a hike. The activity depends on the people involved, but what is consistent is the goal to build relationships of support and encouragement.